Thank you very much for your presence. This visit has been conceived as a visit of solidarity with the Libyan people – The Libyan people that have suffered too much and deserve to live in a normal country with normal political institutions, with peace, security and prosperity. 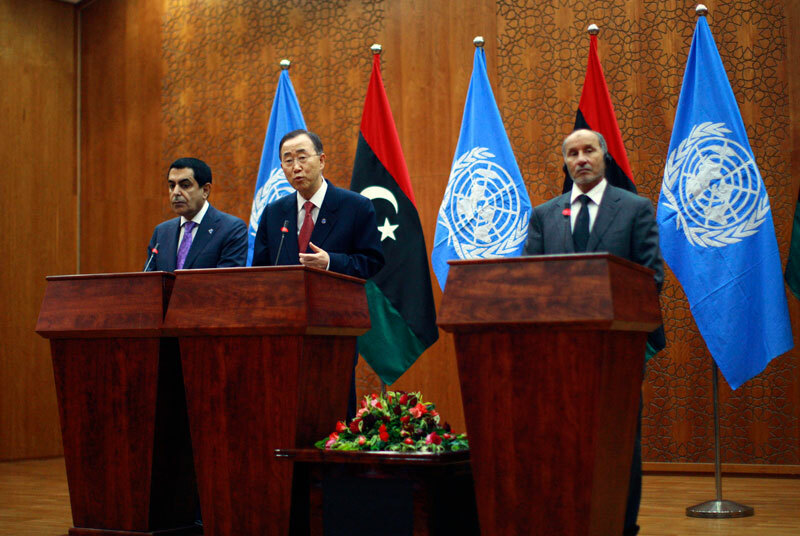 The UN has no agenda and no interests in relation to Libya but one: the welfare of the Libyan people, the peace in the country, and the possibility to live in a normal democracy and to take profit of the enormous wealth of the country to benefit its citizens. I am very honoured to be in Libya once again on my second visit after the revolution. Mr. Chairman of the National Transitional Council, Mr. President of the General Assembly of the United Nations, Ladies and Gentlemen of the media, citizens of Libya, As-salamu alaykum! It is a great honour for me to be visiting at this historic time in Libya – a liberated and new Libya, together with the President of the General Assembly of the United Nations. We are here together to send our strong support and admiration and respect for all your heroic struggles to achieve democracy and freedom. I salute the brave people of Libya. Ladies and gentlemen, it is a great pleasure to see you all in Sirte, Libya. I am here to talk with the leaders of the Arab world at a critical time for the region, just one week after I visited Israel and the occupied Palestinian territory. And I have been able to hear from the leaders who are in Sirte about their own efforts. Last night, I spoke to the League of Arab States' follow up committee meeting, and I made it clear that we share a strong interest and responsibility in supporting efforts to bring the parties together and negotiate a political settlement. It is a great honour and privilege to participate in this important summit. I thank you for inviting me to join you.